Washington (CNN) – House Democratic Leader Nancy Pelosi said Tuesday she plans to sit with Republican Congressman Roscoe Bartlett of Maryland during the State of the Union address, not House Majority Leader Eric Cantor, R-Virginia, who had invited her to sit with him. Cantor will instead sit with a Democratic colleague from Virginia, according to spokesman Brad Dayspring. Pelosi, who announced her State of the Union bipartisan partner in a tweet, had asked Bartlett Monday to sit next to her, before Cantor's invitation, according to a Pelosi aide. Bartlett said in a statement, "I look forward to sitting with Democratic leader Nancy Pelosi at tonight's State of the Union speech. I also look forward with great hope that Congress and all Americans will listen to President Obama give another speech in the spirit of his address in Tucson." Pelosi represents a California district in Congress, but she is a Maryland native, and members of the Maryland delegation say she has always kept a close relationship with them. Bartlett's spokeswoman said Pelosi had invited him to a reception when she became Speaker in 2006. Joining them will be another California Democrat, Judy Chu. 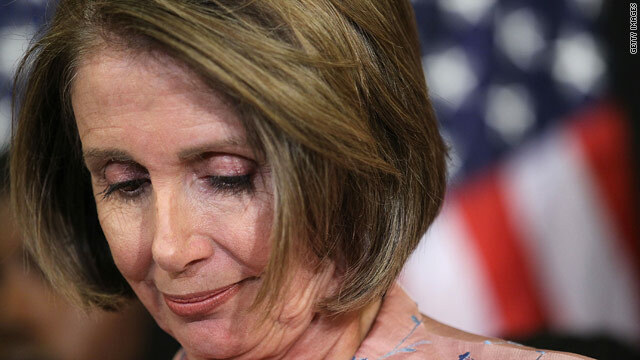 Although Pelosi and Cantor won't be sitting together, other members of the House leadership in both parties are working on a plan to be next to one another, according to House Minority Whip Steny Hoyer. Who REALLY cares where they sit? Enough already. Just do what WE the people pay you to do and create some JOBS (you know those things that pay your bills). Americans are such silly people. No wonder we are in LAST place. Can we please get OFF this subject? Cantor spread cooties...why would anyone wanna sit with him is beyond me? Maybe Brittany Spears....because he was head over heels in love with her at the the Brittany Spears concert, remmber?! Glad Pelosi can see through Cantor's BS and through his vacous oblongated head! Good for her. All Cantor does is tweet while the President is speaking. I saw him doing it last year during the President's State of The Union Address. Well, the Republicans extended the hand and the wicked witch of the west spit on it. So much for civility. Poor poor Nancy still isn't over the Nov. election. Maybe she needs to enroll in an anger management program. People like this could crack at any moment. WTF are we children or like teenagers in a lunchroom who is sitiing with whom,.,,,,This is silly...It is really simple,..It's like when you go to the movies you try to grab the best sits and those are usually the first taken....NO one comes into a theater with the objective whom will I sit next too.You congress people are silly! MY objective when I go to a crowded movie I like to sit near the exit,,I want to be first out. So why does CNN have to post such polarizing and sensational headlines?? Ms. Pelosi wasn't being rude to Mr. Cantor as the headline made it sound; she is simply honoring her previous engagement. It is commonly practiced etiquette to decline all later invitations after one has been accepted. One cannot accept with a caveat should a better opportunity come along. Shame on CNN...they should know that we are all tired of these divisive and misleading headlines. As legitimate as I think the symbology is intended to be and as nice as it is to see them at least making some type of effort to show unity and create a collegial atmosphere, it still smacks of playing musical chairs while Rome burns. Why would she want to sit with that creep...Cantor is nothing but a pervert. He"ll be the next member of the party of morals and ethics to be caught signalling under a bathroom stall, entertaining hookers, or trolling the internet for kiddies. Scandalous! How dare she! What ever happened to civility???? Could it be that Nancy is still upset???? Good for her. This sitting together crap is just that crap. It won't change the way the jack boot right behaves. When it's all over they will go back to being their old delusional, paranoid selves again, accusing everyone who disagrees with them of treason. I saw Cantor on Meet The Press; he was great! At dodging the questions. Good for her! I would not sit with Cantor if my life depended on him. That southern drawl of his makes me very uncomfortable. Can you blame her? Cantor is one of the most obnoxious, I'm better than thou, right wingers out there. He most likely made the offer knowing she wouldn't sit with him so he could create some political news over it. I doubt many of his own party care to sit with him. "Cantor invited Pelosi through aides".... what a dream boat. He probably waited to be sure she would have to decline. plotting their next moves for the good of big business. Patriots Salute the Flag! Traitors don't!!! Why would anyone want her near. She smells like the walking cess pool she is. Go back Obama and his lies that all your good for Pelosi. No true American would want to sit with any of these brainless wonders. MY GUES IS WE WILL NOT BE A COUNTRY IN FIVE YEARS BUT BY OBAMA'S ACTIONS IT WILL BE BLAMED ON A REPUBLICAN OR TEA PARTIER FOR ONE OF THEM WILL BE IN OFFICE BY THAT TIME. BUT FAR TOO LATE TO SAVE US NOW FOR OBAMA HAS ALREADY GIVEN US TO THE DEVIL NATION RED CHINA. HE MUST BE IMPEACHED FOR THIS. Sounds like a high school cafeteria. So-n-so is sitting next to such-n-such. Make it a mosh pit or festival seating until such time as the Congress can play well together and help the majority of citizens. Government is about shooting arrows and drawing targets around where they land. See! We hit our targets and accomplished things. Congress needs to agree to SMART goals, like real world organizations, then measure success. If the goals are not reached, kick all of their backsides out and garnish their future wages for wasting our time. Sit with who and where you want Nancy!!! GO NANCY!!!!!! I can't blame her for not wanting to sit behind creepy Eric for the entire SOTU. Eric Cantor and John Boehner was so nasty and rude to her during the mid-terms, I hope they get what is coming to them. You reap what you sow! your title is so misleading and dishonest. Nancy Pelosi responded to an earlier request. Not only should we toning down the rhetoric, we should be more responsible in what we write. Shame on you! Maybe Sen. Cantor could swap seats with other members of his Party and make room for all three Democrats. Now that would be bi-partisan!! Somehow this who is sitting with who is worse than just sitting with your own party. And you expected more from Pelosi?? It's not in the spirit of bipartisanship when it becomes a PR display. Sometimes silence speaks much louder.